As a child of the 80’s, the NES and all the great games it brought to the 8-bit generation littered my elementary school days with many fond memories. However, I can still remember the fall of of 1989 when the Sega Genesis (known as the MegaDrive outside of the USA) and its initial library of games had a multi-page layout in the JCPenney’s Christmas Wishbook. I could help but be in awe of the screenshots of games that looked like something I would only see in the arcades. Yes, that was exactly what Sega wanted me and many other kids my age to think. 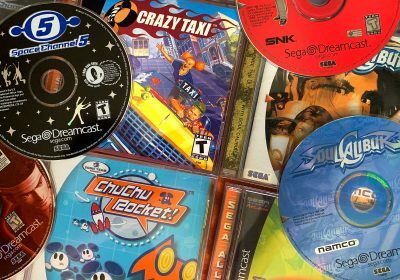 As the Genesis established itself as the most cutting-edge console and the home of games that were more geared for kids as they entered their teens, I increasingly fell into Sega’s target market. At that point, I had enough of Super Mario Bros. and wanted something faster, flashier, and with “attitude”. Sega reached its peak with the Genesis and Nintendo actually had to work overtime to win its market share back during the 16-bit era. It all turned out well, however, as gamers of the 1990’s were treated to many excellent games due to intense competition. 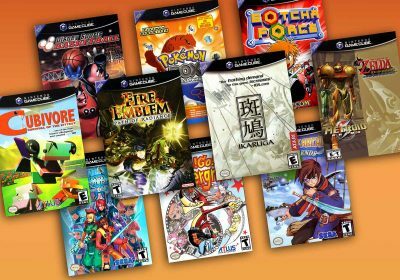 In this installment of the Games That Defined Series, I actually had a tough time narrowing down the list of titles to feature. There are a number of otherwise worthy titles, that I had to stick in the honorable mentions list in order to keep this article from going on forever. Regardless, I hope you enjoy this piece and I look forward to hearing your memories of the Genesis in the comments section below. Without Sonic the Hedgehog, it is hard to tell how successful the Genesis would have been in Sega’s fight against Nintendo. The blue blur was the killer app against Mario and the Mushroom Kingdom. Not only did Sonic make Mario games look sluggish with help of Blast Processing, but he helped Sega establish their cutting-edge attitude that helped them gain a strong fan-based during the 16-bit era. Being a faster version of Mario wasn’t enough to make Sonic stand out. To complement his speed, Sonic was treated to a number of incredible level designs filled with bright colors, eye-popping loops, and multiple paths. The levels are optimized for the trademark speed without sacrificing the important exploration element. Each level is very distinct and featured an interesting gimmick. Many themes were repeated throughout the series, but were always given a fresh flair. Examples are the fresh-but-fast Green Hill Zones, your colorful and zany Casino zones, and your don’t-run-out-of-air Underwater Zones. The gameplay itself is very intuitive as it only requires single jump button. However, Sonic can turn into a dangerous ball of speed if you duck down while running. Sonic also accelerates to ultra-high speeds if you have enough of an uninterrupted runway, and the game’s levels tempt you to pick up speed in order to reach more and more rings and other bonuses. In addition to the normal gameplay, the entire 16-bit Sonic series was blessed with both excellent boss battles and bonus levels. Dr. Robotnik redefined what a level boss was like with his wide variety of impressive mechanical creations that each had a unique attack style and weakness. 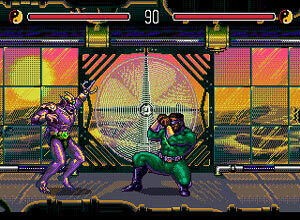 The bonus rounds for each game not only offered a different type of objective, but they also showcased some innovative graphical techniques to flaunt what the 16-bit powerhouse could do such as trippy backgrounds and pseudo-3D effects. 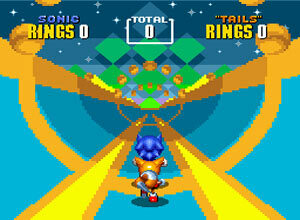 Sonic the Hedgehog 2 also introduced the famous super spin dash as an integral piece of Sonic’s arsenal. This new move not only let you go from a stand-still to high speeds much quicker, it was also a invaluable attack in a number of situations. The spin dash has become such a staple in the Sonic series, it feels weird going back to the original Sonic. And of course, Miles “Tails” Prowler joined in on the action, allowing you to have a tag-along or play as the two-tailed fox on his own. With the extra character, Sonic the Hedgehog 2 was now open to having a 2-player mode. Sonic the Hedgehog 3 took the series one step further in many ways and brought the franchise into full blockbuster mode. Part 3 improved the graphics and animation quality while adding mini-bosses and special powerups that gave Sonic access to some enhanced jumping, gliding and attacking techniques for added depth. Tails also become a more useful character in Sonic 3 as he can finally fly under his own power. Players adventuring alone can control either character, or two players can join in together and simultaneously run and jump through each level. 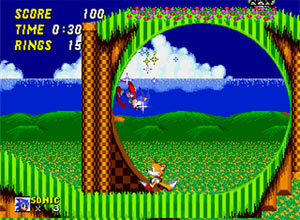 Tails can even pick up Sonic and give him a helicopter boost in that mode. The final 16-bit Sonic installment, Sonic and Knuckles was actually developed as an extension of Sonic 3, but added Knuckles as a playable character and featured lock-on technology that let you attach the older Sonic carts in order to play as Knuckles on the previous games. Sonic & Knuckles was a great game on its own, but the lock-on cartridge blew the minds of Sonic fans everywhere and got them all re-playing their old favorites with Knuckles and his climbing and gliding capabilities. Obviously, the Sonic series enjoyed great success in the 16-bit era and put up a great fight against Nintendo’s strong Mario franchise. Sadly, Sega and Sonic Team would never quite match the level of brilliance seen on the Genesis as Sonic has become a bit of a joke in recent times thanks to a string of lackluster 3D titles. After observing Nintendo’s success with Mario as a mascot character, Sega wanted them to come up with a mascot of their own. The only requirements were that the new mascot would have to be as easily recognizable as Mario, yet different from him as possible. One of the final contenders (in addition to Sonic) was a pair of “funkadelic” aliens named Toejam and Earl, who were both very hip and cool (by the standards of the early 1990s). 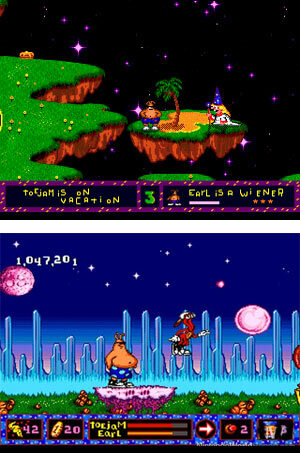 Sega executives liked the idea and liked the game, but Toejam and Earl were too laid back and American in nature. Toejam and Earl didn’t win the role of the new Sega mascots, but they were interesting and unique enough to warrant the creation of their own game. The original Toe Jam and Earl is a relatively slow-paced, collect-the-items game with early 90’s hip-hop influences, unique graphics, and a really juvenile sense of humor. You play as two funky aliens who are on earth looking for the remaining pieces of their rocket ship. You must complete 25 levels trying to find them, and if you didn’t find them, you must go back and search each level until you have. This game really shines when played with the two-player, split-screen mode. Both players can cooperate together to try and find the missing pieces of the rocket ship. Throughout the game you will find “presents” which can be either beneficial or detrimental to your cause. Unfortunately, you have absolutely no chance of knowing what’s inside before opening it. It could be a pair of wings, so you can fly over islands, or it could be removal of one life. It’s a gamble that adds some depth and strategy to this quirky, cult-classic game. The second game in the series, Panic on Funkotron, took a strong departure from the original’s gameplay and became more of a standard platformer. This was quite a disappointment to many of the game’s fans, but the sequel is still a solid game. In Panic on Funkotron, our funky alien friends have accidentally unleashed those disgusting humans from Earth on their home planet of Funkotron. Your job is to capture all of these obnoxious creatures and send them back. In addition to collecting items, you capture the humans by throwing magical jars at them. The visuals are fantastic, with cartoon-quality animation. The two-player mode has been retained, but it has a different feel to it since you must remain on the same screen as your partner. The Sega Genesis had a heaping spoonful of quirky yet delightful titles and Toe Jam & Earl was one of the first that set Sega apart in terms of creativity. This cult favorite broke the monotony that the glut of side-scrolling platformers brought. This uniqueness is the primary reason that fans were so dismayed by the format change in the game’s sequel. It is hard to put your finger on what makes the Toe Jam and Earl game stand out, but everything from the gameplay, music, and characters is so well done that it melds into an unforgettable experience. “Rise From Your Grave!” That phrase alone will probably send a nostalgic chill down the spine of any early Genesis owner. Altered Beast was the first-pack in game for the Genesis back in 1989 (which is the main reason the game is on this list) and it let gamers control a resurrected centurion warrior who must battle all sorts of undead and demonic in order to save Zeus’s daughter Athena. The game itself is a fairly basic beatemup title, but it is not without its charms. Altered Beast’s power-up system is based on “Spirit Balls” which can be obtained from defeating certain enemies. These little orbs will initially increase your characters strength and size, but after obtaining three orbs, your character can transform into a beast with special abilities such as a werewolf, a thunder dragon, a tiger man, a bear, and the powerful golden werewolf . Each beast has its own special abilities, such as the dragon’s ability to fly. After transforming into a different creature, the strategy of each level changes as your enemies will have to face the doom of your newfound powers. Those of you who were kids back in the late 80’s and early 90’s probably remember the who “Sega Does What Nintendon’t” advertising campaign that Sega put on in order to show how Sega’s Genesis could pump out large, arcade-like graphics that the NES just couldn’t touch. 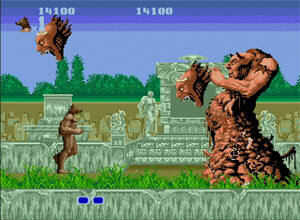 Altered Beast was one of the first posterboys for this campaign as the game featured large sprites, impressive parallax scrolling, and, of course, the synthesized speech that is used from time to time. Of course all these techniques were quite standard by the time the dust settled from the 16-bit wars, they were big news in 1989. Looking back at this early arcade port, it is obvious that Altered Beast is one of the Genesis’s most primitive classics, but it still holds a special place in the heart of many a Sega fan and serves as a bit of a predecessor to Makoto Uchida later projects, the Golden Axe series. After creating Altered Beast, Makoto Uchida was dreaming of creating a wonderful RPG that could rival those of Squaresoft or Enix, but due to Sega’s focus on action-oriented arcade games, Uchida simplified his ideas by bringin RPG-like characteristics to a new hack-and-slash game by the name of Golden Axe. Once Golden Axe’s popularity rose in the arcades, Sega made sure a solid port was lined up for a console release soon after the Genesis launch. The Golden Axe home port proved that the Genesis truly was worth of delivering an arcade experience at home and eventually became the most instrumental piece of Genesis software before Sonic the Hedgehog came onto the scene. In a sea of arcade ports during the early days of the Genesis, Golden Axe set itself apart with a unique storyline and setting, some fresh gameplay ideas, and a variety of selectable heroes that each had their own skills, attacks, and magic spells that had advantages in certain situations. The RPG-inspired spell attacks were especially handy when traditional hacking and slashing wasn’t enough to take out all your enemies. When a spell was cast to unleash devastation on a screen full of enemies, it felt especially empowering when earth shook, explosions rocked the screen, and enemies lit up in destruction. Throughout Golden Axe, there were also a number of creatures that you could ride. Once you hopped on, you had more attacks at your disposal. You could even attack groups of enemies at a time by swiping the creature’s tail and, in the case of the larger dragons, can deal heavy damage by breathing fire. Since Golden Axe was a great success on the Genesis, Sega pumped out two additional sequels for the Genesis, but they never quite lived up to the original. They failed to innovate and keep up with the other cutting edge Genesis games that had been released since 1990. Even though it was a solid game, Golden Axe 2 was particularly disappointing to Genesis owners as it was a significantly different (and inferior) game to the arcade sequel. 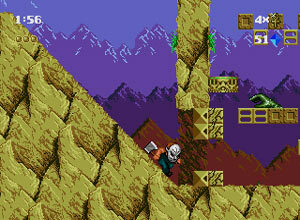 Golden Axe 3, on the other hand, was such a letdown, that Sega didn’t even bother to release it outside of Japan. The Phantasy Star series actually started on Sega’s 8-bit Master System as Yuji Naka’s pet project before starting on the Sonic the Hedgehog series. It received high acclaim and collected a strong fan following. With the release of new Phantasy Star games, many fans actually bought a Genesis just so they could play more Phantasy Star. One of the greatest turn-based RPG series of the 16-bit era, the Phantasy Star games had rich storyline in a futuristic setting with several worlds to explore. The story itself is half fantasy and half science fiction. It obviously borrows elements from fantasy such as Dungeons & Dragons, but it also expands upon itself by incorporating elements from science fiction pieces, such as Star Wars. As the series is allowed to evolve, it becomes less like a standard D&D game, as the fantasy aspects become intertwined with the technology. The new 16-bit installments ditched the first-person perspective that the first game utilized and instead used a more traditional Japanese RPG gameplay style. This may have come as an initial disappointment to Phantasy Star fans, but the quality of the game was not ultimately reduced in any way. The Phantasy Star series as a whole is noteworthy in that all of the games take place in the same universe, as opposed to many RPG series such as Final Fantasy (where each successive game takes place in an entirely different alternate universe). Each major Phantasy Star game adds a bit more to the series’ overall story, culminating in Phantasy Star IV which ties all of the series’ plot elements together into a dramatic conclusion. Phantasy Star IV is usually regarded as the favorite of the series as it is the most polished and features the best balance of combat, interaction and exploration. PSIV’s most remarkable features is probably the pre-programmed battle sequences, known as “macros”, that allowed you to pull off combo attacks with two or more characters in your party. Other nice features include the manga-inspired illustrations that serve as illustrations for important scenes. While the Final Fantasy installments and other Square RPGs may have gotten all the attention on the SNES, the Phantasy Star series showed that RPG fans could have fun on the Genesis. Even though the Phantasy Star series got its start on the Master System, The Shining Series was actually Sega’s first 16-bit RPG franchise. A first-person dungeon crawler by the name of Shining in the Darkness started things off. Unlike the Atari ST classic, Dungeon Master, Shining in the Darkness has a much stronger Japanese influence with its random battles and turn-based combat. The storyline is very typical of a traditional fantasy RPG and set the stage for the rest of the Shining games that followed. Shining in the Darkness’s developers, who would be later known as Camelot Software Planning, put on a beautiful show even in the early days of the Genesis. Even though first-person dungeon crawlers had been done before, Shining in the Darkness treated Genesis owners to some impressive dungeon mazes that were rendered in three dimensions. Each of the enemies and the town-based environments were also detailed and interesting. Even from this early title, you can see many characteristics in Shining in the Darkness that were carried onto later games that Camelot developed for Sega and Nintendo. 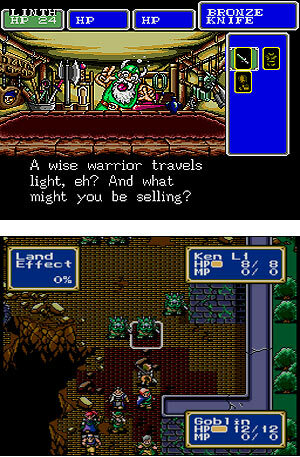 The second game in the series, Shining Force, was one of the first groundbreaking titles to make lay a foundation for the strategy RPG genre. Camelot departed from the dungeon-crawling focus of Shining the Darkness, and took many of the conventions that were made popular in traditional Japanese RPGs, blended in deep strategy, and produced a package that felt like enhanced game of Chess with a fantasy-based story. Shining Force’s battle system lays out each environment into a set of squares allows you to strategize your placement of your allies (each with different mobility and attack strengths and weaknesses) in relation to your enemies. 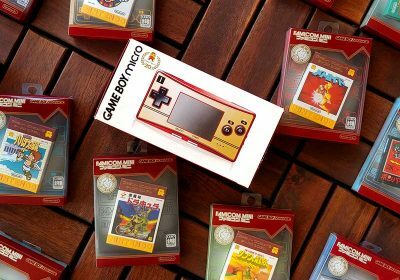 (Modern Nintendo fans would find it most similar to the setup of Fire Emblem or Advance Wars). When attacks actually occur, players are treated to a cool cut-away animation sequence that renders the fighters in more detail. Shining Force 2, not surprisingly, was very similar to the original and continued to bring deep strategy to the table while giving fans a fresh installment in the series. The storyline in both games are not directly connected, but the import Game Gear title, Shining Force Gaiden: Final Conflict (which was also included in Shining Force CD), does draw the two storylines together. Shining Force 2 is much longer than the original, and is more free-roaming. There is also no chapter system like in the original Shining Force, so the player can return to most of the previously accessed parts of the Shining Force world. The gameplay and strategy elements in the Shining Force games hold up against just about every newer game in the strategy genre. It is challenging, but not frustrating. You will not breeze through the game unless you are a strategy uber-geek, but it won’t frustrate a newbie. Cult-classic developer, Treasure was founded when a number of developers working for Konami broke away to found their own company to pursue their own dreams of creating original games. Their first commercial project from their new development house was an original run-and-gun game named Gunstar Heroes. Much like another popular run-and-gun shooter, Metal Slug, Gunstar heroes sends a constant flow of soldiers attacking you from every possible angle. This onslaught only pauses when you reach a boss, of which there are many. There’s more than just running and jumping, however. Your characters can also jump kick, grapple along ceilings, flip downward off of platforms, slide, super slide, and throw the majority of enemies back at their comrades. One of the main elements that makes Gunstar Heroes stand out in its genre is its deep weapons system. It offers four basic guns: force (a pulse laser), lightening (a beam laser), chaser (a homing weapon), and fire (a flame thrower). Each of these can be used alone in a conventional fashion, but the real fun begins when you combine two weapons to create more powerful weapons that are more useful for certain combat situations. As if Gunstar Heroes’ gameplay wasn’t reason enough to play it, the game’s graphical effects also blew the minds of many a Genesis owner. From the rotating, pseudo-polygonal intro logo to the warping, scaling, and rotation effects throughout the actual game, you know Treasure knew what they were doing with this game. And of course, all this eye candy only threw more fuel on the fire that was flying back and forth between the Sega and Nintendo fanboys of the era. Gunstar Heroes is a classic in every sense of the word with its strong combination of technical accomplishments and top-notch gameplay. 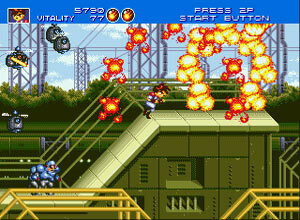 I can confidently say that Gunstar Heroes is perhaps the best run-and-gun shooter ever to grace a 16 bit console. 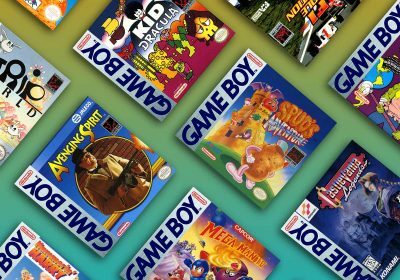 The 16-bit generation has some of the fiercest competition in gaming history, especially considering that the gaming industry hadn’t turned into as much of a money producer as it is today. 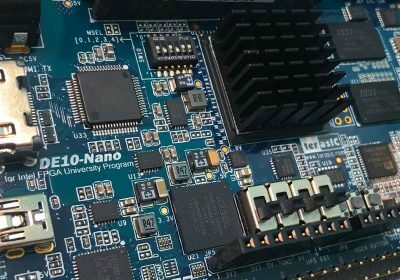 Nintendo and Sega were obviously the two big players and were constantly trying to out-innovate each other and trying to push the technical limits of their respective machines. Vectorman, in particular, was an answer to Nintendo and Rare’s Donkey Kong Country series and its pre-rendered, 3D-like graphics. It featured its own three-dimensionally-rendered character and provided some animations, which, in my opinion, were even more impressive than DKC. Just watching the title animation sequence makes it difficult to believe that Vectorman is a Genesis game. 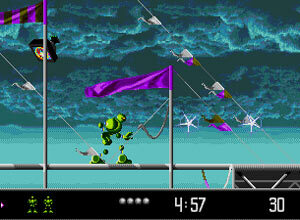 Of course, there is more to Vectorman than just its technical prowess and eye candy. Both titles are straightforward run-n-gun action platformers with a wonderful balance between the genres. Vectorman doesn’t focus on only the shooting aspect like Gunstar Heroes or Contra does, but also requires a lot of skilled jumping that you would expect in a solid platformer. Vectorman is equipped with a blaster that fires one bullet at a time, but he also has access to powerups such as a machine gun and triple-fire guns. Vectorman can shoot downward during a descent that will not only slow yourself down from your fall, but take out enemies as well. There are also other powerups available to temporarily transform Vectorman into other forms such as vehicles and bombs that will make your destructive duties easier. Vectorman 2 is very much like the original game, but has a bit more graphical polish and a slightly higher difficulty level. (But three difficulty levels are available in the options) Overall, Vectorman 2 is a very suitable sequel to an already amazing game. The Vectorman games are some of the most well-rounded action games on the Genesis in terms of graphics and gameplay and should be a cornerstone of any Genesis collection. In order for Sega to compete with the SNES’s library of Capcom’s arcade ports such as Final, Sega brought out a polished beatemup of their own with Streets of Rage. Sega worked hard to capitalize on the weaknesses within the SNES port of Final Fight and create a superior product. For some strange reason, the Super Nintendo port of Final Fight did not include a two player co-op mode and only had two characters to choose from. Even though side-scrolling beatemeups can be fun with a single player experience, the games are always more fun with a friend to share the carnage with. Streets of Rage, on the other hand, made sure to include multiplayer capabilities so Genesis owners could share the fun their friends. 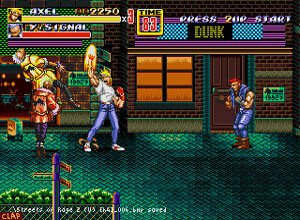 The Streets of Rage series also took the brawler genre to the next level with a wider ranger of attacks. The punch and jump buttons let you execute a surprising variety of moves, including throws, jump-kicks, head-butts, and body slams. The “special attack” button calls in a police car which fires a cannon that rains down fireballs on everybody but somehow doesn’t harm the good guys one bit. Overall, Streets of Rage 2 is regarded as the best game in the series, and one of the best beat’em ups of the 16-bit era, although it was considered by many fans to be relatively easy — even on the highest difficulty setting. Streets of Rage 2, driven by the strength of the fresh soundtrack, groundbreaking gameplay, and an incredible two-player cooperative experience, was easily one of the best games available for the Sega Genesis, regardless of genre. Instead of adding a fourth installment to the Streets of Rage series, Sega turned to their Sega Creative Institute group to take great creative liberties by creating a completely new side-scrolling beatemup that stood out from other games in the genre. Comix Zone is an extremely original and visually impressive game which immerses you in a comic book world. 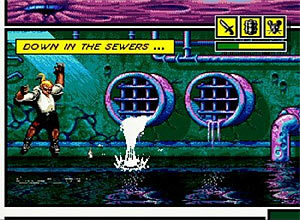 Instead of featuring a character that simply walked down a city street and beat people up, Comix Zone had the game’s hero sucked into his own comic book creation and battle the villains within actual panels of comic book pages. Comix Zone was released near the end of the life of the Genesis and really made the most of what the little machine could do in terms of color palate, sprite sizes, and animation. Technical feats aside, the visual style of Comix Zone was very impressive as well. The comic book panel construction has been expertly crafted. The designers seem to be heavily experienced in how a graphic novel is constructed in order to produce an authentic look and feel. It isn’t too often that I would include sports games in a list of defining games. After all, sports games are always the first to get ditched when a new year comes around and are left in used games stores being sold for pocket change. 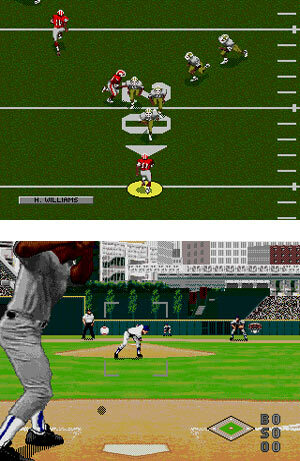 However, Sega’s sports games were some of the biggest selling feature on the Sega Genesis. The NES had a few good sports titles such as Tecmo Bowl and Baseball Stars, but in the push to have more realistic graphics, gamers in the 16-bit era expected more out of their sports games. Sega stepped in and took the visual, audio, and gameplay to the next level in order to bring an arcade-quality sports experience to the home consoles. The first major innovation from Sega’s sports games were the realistic announcers that did the play-by-play in the Sports Talk Baseball and Football games. Of course, announcers in sports game are expected now, but in 1991, voice samples in console games were a big deal — especially when it continued through the entire game. Sega eventually refined its sports titles to the point of being the best in the business and had an equally strong marketing campaign teaming its Sega Scream attitude with the hottest sports starts. I still consider NFL ’94 With Joe Montana to be my favorite football game as it has a great deal of depth without being too complicated. It let you easily browse through a number of pre-defined plays, but easily improvise and adapt to the changing situation, if needed. It took EA’s Madden a couple more years to really catch up with Sega’s efforts. Sega’s World Series Baseball completely changed the look and feel of baseball video games with it’s behind-the-batter perspective and animations based on motion capture of actual baseball players. This was a huge step over the previous baseball games that looked like a top-down perspective of a set of Lego figures playing stickball. Many of the techniques used to create World Series Baseball would ultimately be used in many of the baseball games used in the 3D games on the future consoles. World Series Baseball also added and extra layer of realism by having actual replicas of every Major League ballpark to play in. For serious baseball fans, it wasa treat to be able to tour all the parks. WSB also introduced some other great features such as the Home Run Derby and the ability to have your player celebrate while doing a home run trot around the bases. Since the Nintendo never had much of a focus on sports games, the increasing number of sports fans getting into video games largely turned to Sega to get their interactive sports fix. This move not only helped solidify Sega’s cutting-edge attitute, but also further entrenched Nintendo’s reputation of making consoles for the kiddies. Kid Chameleon’s premise is based on every video game-loving kid’s dream of getting sucked into a video game. However, unlike TRON, our main character is a sunglasses-and-leather-jacket-wearing teenager known as Kid Chameleon, who has to go in and save all the children that have been taken prisoner by a new Virtual Reality game that showed up in town. At its core, Kid Chameleon is a very standard run-and-jump platformer that owes a lot to Nintendo’s Mario games. However, Sega did throw in a number of unique features to give Genesis owners something to keep the busy. As you might be able to guess from the title, Kid Chameleon has the ability to change his appearance and abilities, which is accomplished by putting on a variety of masks. There are nine different masks and abilities throughout the game and include the Iron Knight which allows you to take more hits, the Red Stealth is a Samurai who can defeat enemies, break through some floors, and jump higher, or MicroMax who is stick to walls and is able to fit in small places. Most of the 94 (yes, ninty-four) different levels give you the chance to switch among two or three masks, and there are usually multiple paths through a level as a result of being able to smash through walls or climb over lofty obstructions. Kid Chameleon is a dated platformer by today’s standards, but as an early entry in the Genesis library, many Sega fans have fond memories of this creative Mario clone. If you think Grand Theft Auto and Manhunt were the first games that sparked the “violence in video games” debate, you need a history lesson from the 16-bit era. With Street Fighter 2 bringing new life into the arcades, there were many clones showing up to get in on the action. To be successful, each fighter had to have something remarkable to make it stand out. 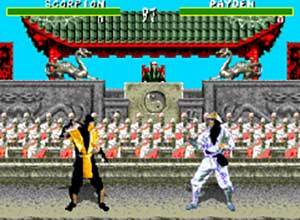 Mortal Kombat was a killer fighting game in every sense of the word. In addition to solid fighting action that you might expect from a headlining game, it was also know for its heavy use of blood and trademark finishing moves that often had relatively graphic displays of violence. Granted, the pixilated gore is pretty tame by today’s standards, but there were a lot of parents and politicians worked up about it at the time. Acclaim Entertainment possessed the exclusive rights to the console ports of Mortal Kombat and its successors. Both Sega and Nintendo wanted the game badly, and both paid Acclaim well to get it. There was just one minor difference between the two, but it would prove to be the distinguishing selling point between them. The Genesis port was faithful to the arcade original, right down to the bloody finishing moves. The Super Nintendo version, on the other hand, was not. Acclaim was forced to remove the finishing moves from the SNES port due to Nintendo’s strict quality control standards. Since there was little point in playing Mortal Kombat without the blood and finishing moves, the Genesis version of Mortal Kombat outsold the SNES port by a ratio of 4-to-1. Genesis fans didn’t feel so bad about getting a slightly inferior port of Street Fighter 2 now that they had the uncensored version of Mortal Kombat in their rooms. Street Fighter 2 and Mortal Kombat were both huge money-makers in both the arcades and on the home consoles. Nintendo had the edge when it came to being able to have the best ports of Street Fighter 2, Mortal Kombat II, and even TMNT: Tournement Fighters, so Sega was determined to create their own 2D fighter that would not only be an exclusive for the Genesis, but would beat both Street Fighter 2 and Mortal Kombat at their own games. Eternal Champtions featured a deep fighting system and a surprisingly-intricate storyline that revolves around changing one’s destiny and the fabric of time. Each fighter possessed 35 basic moves and a whopping 17 special moves, making Eternal Champions the deepest fighters ever made at the time. The fighting engine was soo deep that most gamers would never master all the moves for a single character, let alone the entire cast. The developers behind Eternal Champions did their best to incorporate real fighting styles in the game. Most of the characters use a real form of fighting that makes combat more authentic and requires strategy and long-term thinking. Unlike Street Fighter 2, standing in a corner launching fireballs would not work very well in a heated battle. In a response to Mortal Kombat’s fatality system, Eternal Champions featured background deaths, or “overkills” in each of the nine stages. This gave the player a great number of methods with which to dispatch his foes and increased the replay value. Eternal Champions was not without its flaws, but was a respectable first outing for Sega. The sequel on the Sega CD eventually improved on many of its inadequacies, but since the series was eventually killed off to make room for Virtua Fighter, it never had the chance to make the impact that Street Fighter and Mortal Kombat did. Ecco the Dolphin broke most of the conventions of the platforming genre and distanced itself from the controversial violence-centered gameplay like that of Mortal Kombat. Ecco offered Genesis owners an escape from typical game environments and let them explore the oceans and have a good time with the unique gameplay elements. On the surface, Ecco looks like a typical children’s game. However, when you actually play the game, you will immediately find out that it is full of challenging puzzles and adventures. This critically acclaimed title also featured spectacular water effects and a brilliantly colorful undersea world. Ecco’s movement is silky smooth, and at first, swimming around in the open sea and jumping out of the water is fun in of itself. The goal of each of the 25 stages is not immediately apparent, but you’ll find hints by “talking” to other sea creatures you run encounter. Action-oriented gamers may find Ecco a bit tedious, but this is a very satisfying game. A sequel “Tides of Time” was released shortly after and is an equally entertaining and challenging game. Shinobi was already one Sega’s flagship characters in the arcades, on the Sega Master System, and various other platforms. The Shinobi games have always been a showcase of Sega’s technical accomplishment and they couldn’t wait to take advantage of their own 16-bit platform. Revenge of Shinobi was the unofficial sequel to the original Shinobi and the debut of the ninja on the Sega Genesis console, The Revenge of Shinobi was widely praised at the time of its release and, for a while, was one of the most popular games on Genesis. 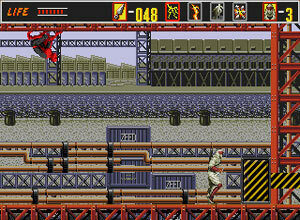 Shadow Dancer is the second Shinobi title on the Genesis and is the official sequel to the arcade game. This time, our hero, Joe Musashi is accompanied by Yamamoto, the shinobi dog. The dog effectively adds a strategic element to the action, allowing you to subdue even the toughest enemies. Today these ninja-based games are still noted for their high quality of graphics, gameplay and music, as well as their difficulty. Anyone wanting to dive into some old-school action with a challenging world to do battle in should look into the Genesis’s Shinobi trilogy. The Shining Force was the most original game at the time and defined what a strategy/rpg should be, nice!!! Great list all around, you hit all up all my favorites. Neither did Vectorman or Comix Zone. They were late titles that are probably more popular now than they were back then. Perhaps they had a bigger impact in the US though. The Shining series seems just a bit too obscure to make it on the list. I had never heard of it until a few years ago. There could definitely be more sports genres featured like NHL and NBA. Ghouls ‘n Ghosts seems to have been one of the early system sellers, and it’s a good port so I think it’s worthy of being on the list. Kid Chameleon was an early title, but yes, it was quite popular back then. Vectorman was definitely a major player as well. It was crucial in keeping the Genesis relevant with the emergin 3D technology. It was also very commonplace on Genesis demo machines everywhere. And of course, it was popular enough to recieve a sequel. I could see how people could debate Comix Zone, but I thought it really was a good showcase of Sega’s innovation. I’m sorry you never heard of it sooner, but Shining Force was and still is one of the most popular Sega franchises. 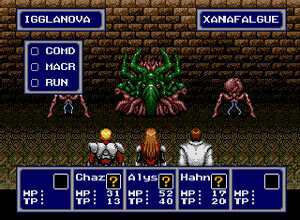 It was definately right behind Phantasy Star in terms of the big Sega RPGs. As for the sports, there were NHL and NBA games, but NFL and MLB are what Sega put the most focus on and made the most innovation. To be honest, the others were mostly afterthoughts. I would argue that late-lifespan titles definitely help define a console because they squeezed the most out of the hardware and had a larger install base to make a possible impact on. It’s not just the early titles that put a console “on the map” that are usually considered for these articles. Racket, I hate sports video games but Alex may have a point on the NHL games. Ever seen “Swingers?” You know it’s defining when a mainstream movie uses it. Also, kudos to Wonder Boy in Monster World! Love that one. It’s a recent discovery for me. Some great choices, it good to see this series up again, its one of my favourites. Shinobi and Comix Zone FTW! You could have made a collective group for the Disney titles as they were successful and when I was a kid(and I’m sure this is the same for others) in my eyes these games shaped the MegaDrive alot. Aladdin is missing from the list. Most amazing looking game on the genesis, music was great, and the gameplay is one of the better movie adaptations that is actually fun. The only flaw was that the game was too short, but it still was a masterpiece. Nice to see Altered Beast on the list. People seem to mock it, but I loved it as a kid and still think it has some merits. Well as I said maybe things were a bit different in the US. It’s a decent game but it’s not what people think about when someone mentions the G/MD. Being an early title doesn’t have mcuh to do with the subject. You do have a point about Vectorman, it should stay on the list. Still it was pretty obscure, like RPGs in general, and in comparsion spanned 2 games (3 with the SCD) instead of 4 for PS. I agree that it’s a great series though. But looking at them today, the NFL games play like crap. They’re extremely slow. Football isn’t big here in Europe though. Btw I was also surprised to see Thunder Force only as an honorable mention, it’s definitely the most popular shooter series and impressed a lot of people with graphic effects and better than SNES-speed. The Disney games were a big deal back then and they do deserve at least an honorable mention (Aladdin, World of Illusion, Mickey Mania, Quackshot). 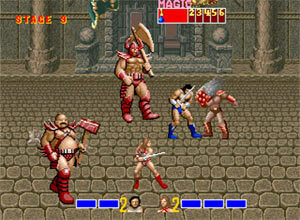 The golden axe screenshot seems to be from the Arcade version. Aladdin to be considered please. I think it’s a trully example of “Games that define Genesis” in terms of delivering both a game to be played by kids and adults at the same time, superb music and graphic style. 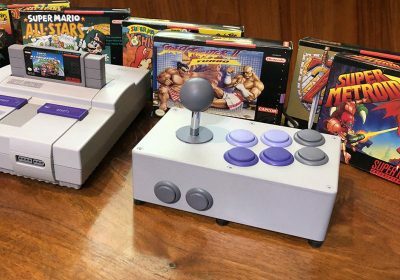 Ok, there are some great games there like Sonic, Gunstar Heroes and Contra but… it seems pretty obvious to me that the Genesis didn´t stand a chance against the SNES in terms of quality. I think there are better platform games (mario world, yoshi island, dkc, mega man X), better fighting games, better rpgs and so on. The only thing Genesis could achieve and the SNES didn´t is really fast speed but most of the arcade port are a little mediocre to my taste. That´s one of the reasons why I really love the Saturn. It has amazing arcade-like games that rock in every aspect: graphics, sound, processing power and playability. I see a lot of arguments here about games that did well in the U.S. not being definitive because they didn’t do well in Europe. If I’m not mistaken it is the U.S. market that defines success internationally in the video game industry for the most part. If a game does poorly in Europe, or even to some extent in Japan, but is a huge success in the U.S. it rakes in more money than in either of those two markets. Take a look at Halo, its the series thats defined the Xbox and yet it tanks in Japan. The U.S. is definitely the market to take in this industry, and to say a game shouldn’t be considered definitive just cause its not so popular in Europe seems a bit misguided when it comes to this kind of thing. When I talk to people about the Genesis here in the states I hear Sonic, Vectorman, Kid Chameleon, Echo the Dolphin, and Comix Zone more than any other games (though Road Rash is getting up there too). A most magnificent appraisal as usual Racket! I’m going to check out all the games flagged up (by commentors too), as I have been fortunate enough to accquire two emulation discs which contain nearly every Megadrive EVER on my Dreamcast! Happy days! Altered Beast, Moonwalker, Shinobi, Golden Axe, Castlevania, Aladdin, Comix Zone, Micro Machines, Sonic! I can barely contain my excitement!!!! Great list, i recommend to add the Road Rash Series. I remember playing Road Rash with my friends and we had a lot of fun. I think it deserves to be at the honorable mentions and an another reason to put it there is that this game wasn’t released on SNES at all. Earthworm Jim defined it for me. It still does. Why does it get an honorable mention on the SNES list and not on the Genesis list? The Genesis version is the original! The SNES version was inferior in every way except for graphics! So, why isn’t it here? @sebastian. It depends on what kind of games you like, genesis generally had better action games and shooters, but also unique titles like Herzog Zwei, General Chaos, Alien soldier, Toejam & Earl, Road Rash 2 Monster World 3-4 and Ecco 1-2 that weren’t on the snes. But even when comparing them head to head, to me the snes only gets the upper hand in RPGs, because there were so many and the hardware was perfect for the genre. For platformers well, Mario was great but so was sonic. DKC was pretty much Mario with monkeys. Mega Man X while an above average game lacked the charm and difficulty of the nes games and there are a bunch of good action platformers for the Genny like Ranger X, Gunstar Heroes, Mega Turrican and Alien soldier. I don’t see why you need to pick favourites when you can get more enjoyment out of both consoles and their exclusive titles. Hey, never read your sit before, very interesting read. I’m a big collector of obscure Atari, Nintendo and Sega games. I try to find the weirdest and silliest stuff (ie Decap Attack). I want to point out that if not for Sonic, Sega would NEVER have taken off the way it did. After playing Altered Beast, Saint Sword, Last Battle, Gods and several other pre-Sonic games, I would say that despite the improved graphics, those games are incredibly clunky. Had it not been for Sonic the Genesis/Mega Drive would be a quirky collector’s item rather than the massive success it was. And why no mention of Sega’s most amazing products EVER: Splatterhouse 2 and 3?! Edwin, I agree about the Sonic comment — it really got them on the mainstream map. And I’m not much of a fan of the early Genesis games either. Lately, I’ve been going back to playing the ol’ 8/16bit consoles. Not just the consoles I owned growing up but also the consoles/games I missed out on. just recently found this website and i love the reccomendations and the way you think Racketboy. This site has given me loads of replay value and i find myself looking for new games to try out that i missed first time round. I’d like to add that my megadrive playing days started early on in the life of the system and My reason for buying the MD/G was to get EA hockey and golden axe. I agree with the sportstalk games being ‘defining’ but i always enjoyed the EA sports games as i found them easier to pick up and play. Madden series actually sparked my interest in ‘football’ as i had never really understood it before then (Being British). But i also remember losing days to Desert strike (and sequals) and road rash which i wouls suggest was a defining driving game for the platform. Also FIFA95 the start of 3d soccer games. Excellent posts. 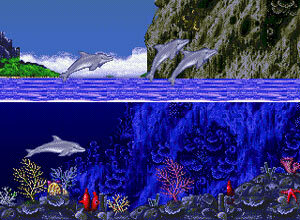 keep up the good work..
Wow, ecco the dolphin was an amazing game for Genesis, a masterpiece in my opinion. Just blew my mind. I was 7 years old at the time in the spring of 1993, and I saved some money ($10) and with the help of my parents bought a Genesis for $199. It came with Sonic 2 and Ecco. Going from my NES with duckhunt and Mario, was incredible. It was just like the games my uncles and I would play at the arcade. Holy cow Sonic was incredible. The graphics just blew my mind. But Sonic was a short game, you could beat it in a couple of hours and there wasn’t any point of replaying it after that other than with friends. My mom personally liked Ecco, she thought he was cute it was a family game and it would be good for me to play it. And it was fun and could be played for hours on end. Each level was enormous, with so many secrets and spots to explore. You were swimming in the depths of a massive ocean, from the Arctic to the warm corral reefs to the dinosaur age with Pterodactyls!! At the end of the level you’d have a password so you could go back. I could only get to the final level by stealing the password from a cheat book, HOLY CRAP! I won’t spoil the surprise, but it gave me the most intense goose bumps. I don’t think I’ve played every level in that game, but I miss it! Hope you find your family Ecco! Excellent list. I would’ve added the following for honorable mention though: TMNT:Hyperstone Heist, Decap Attack, Ghostbusters, Boogerman, Zombies Ate My Neighbors, Road Rash, NHL series, Splatter House 3, Batman, Maximum Carnage, Seperation Anxiety, and X-Men 2. I would remove Moonwalker as well.